Warsaw is one of the most fascinating cities that I have ever been to. A city that has risen from the ashes of the Second World War and the bitter Cold War, Warsaw’s strong foundation lies in its history. Even as tragic tales of destruction echo in the air. 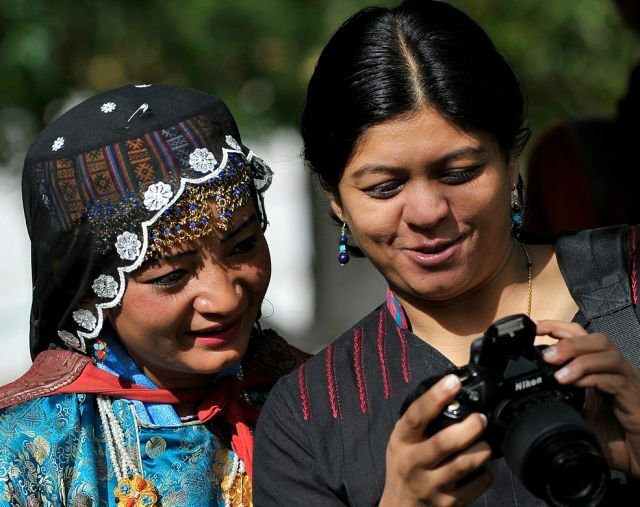 the resilience and the strength of the Warsawians speak volumes as they greet you with friendly smiles. Today Warsaw is hip, young, dynamic and evolving and as my guide Hana says, ” We have just started reclaiming our lives. 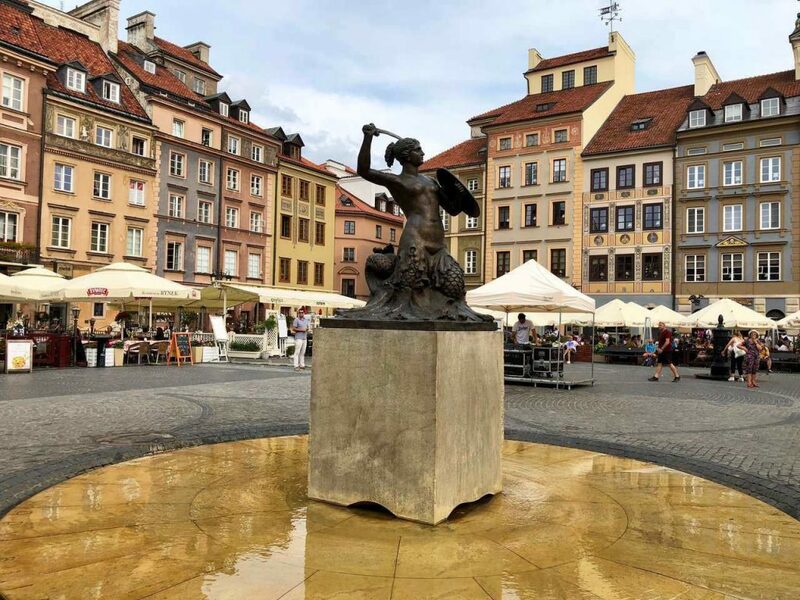 ” In my 48 hours in Warsaw, I journey between the medieval times and contemporary era, losing myself in legends of mermaids . And the magic carpet whisks me into an era when Poland still lived in an idyllic world, bereft of invasions and wars. 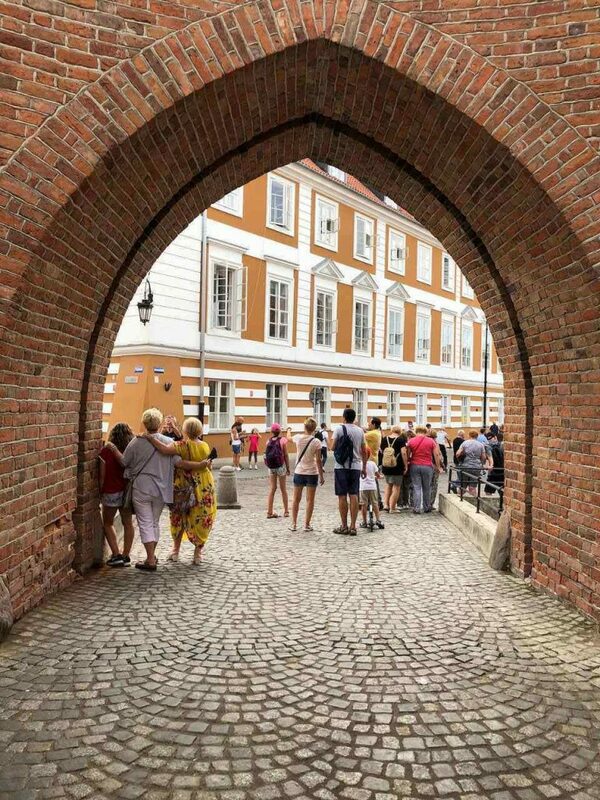 The Warsaw sightseeing itinerary takes you down to castles and cathedrals and many other places to visit in Warsaw where stories echo from every walls. 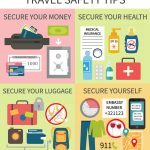 If you are looking at exploring Warsaw , then here are eight best things to do in Warsaw Poland that you must not miss. The colourful Old Town Market Place is a vibrant square where the Old and New Towns meet in Warsaw. Standing there and admiring the colourful houses built in Gothic and Renaissance styles, I am transported to the Middle Ages when the towns were originally built. However these have been reconstructed brick by brick after they were demolished during the wars. It is probably one of the most beautiful arteries in Warsaw linking three Royal Residences starting from the Royal Castle in the Warsaw Old Town to the Palace on the Island on the sprawling Lazienki Park and the stunning Wilanow Palace on the outskirts of the city. These are some of the most beautiful castles of Poland. It may be a bit difficult to walk the entire 17 kms but the entire route is littered with churches, parks, palaces , manor houses , embassies and consulates besides restaurants , cafes and shops. 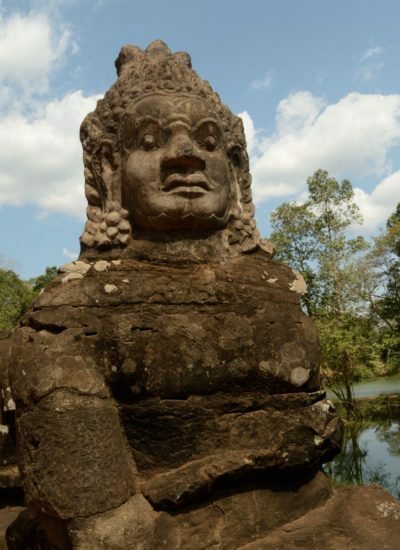 There is a whopping number of at least 20 attractions in this artery which was also a trade route . 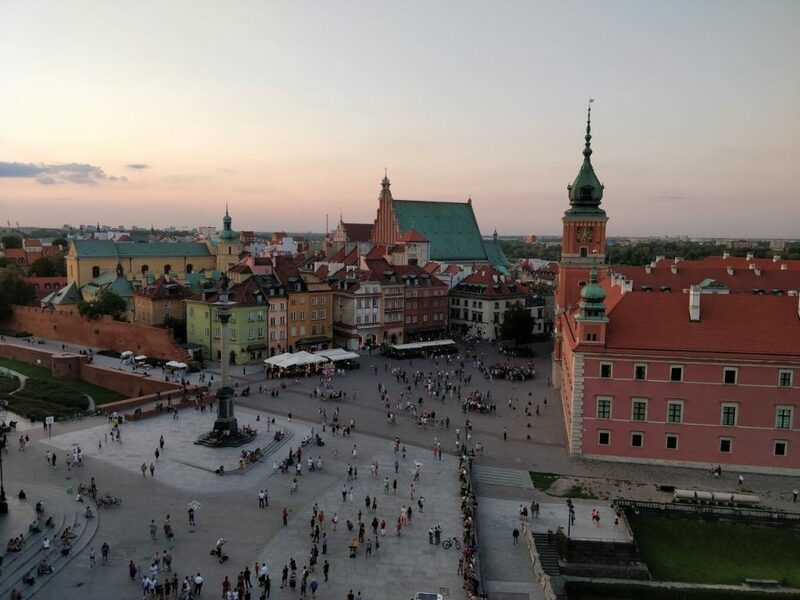 If you are looking for a list of things to do in Warsaw Poland, then just exploring the Royal Route is an experience in itself. Starting at the end of the Old Town in Castle Square, the route ends at Wilanow Castle but given a choice, you can actually drive to Krakow itself. The entire route linking some of the prominent streets in Warsaw is apparently glowing with lights during winter and is a sight to behold. 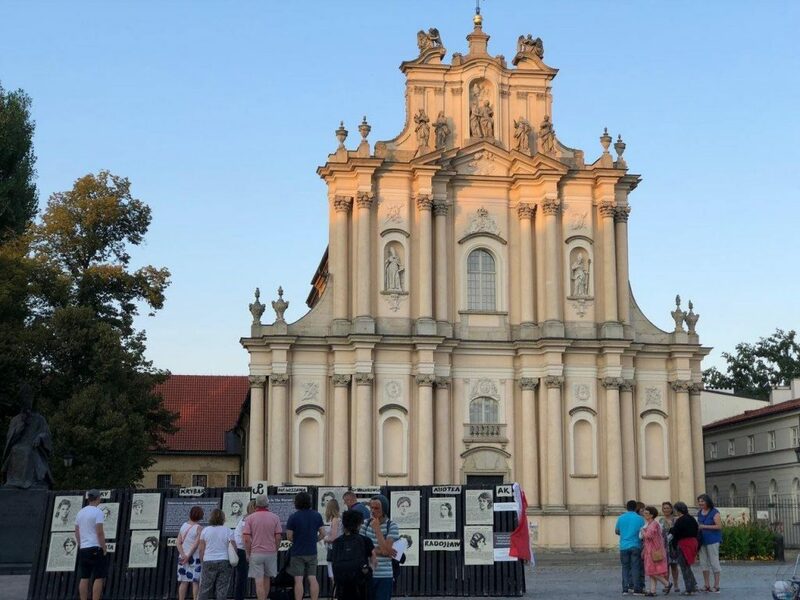 If you have just 48 hours in Warsaw then make time for these churches – Holy Cross topping the list followed with St Anne’s Church besides the Carmelite Church and St Alexander’s Church . The Royal Route is also filled with several palaces, which are part of Warsaw sightseeing. 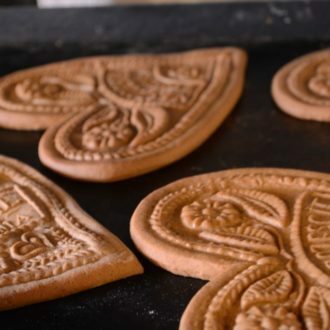 Stop by at the Presidential Palace, Kazimierz Palace and the Potocki Palace which are some of the Warsaw points of interest. . There are several parks galore as well. Besides the Lazienki Park, you can also stroll around the verdant woodlands of Ujazdow Park, one of the largest parks in the Polish capital, which is one of the best things to do in Warsaw I will also recommend a stop at the Nicolas Copernicus Monument where you can pose with the sun and stars besides getting a bit moonstruck too. 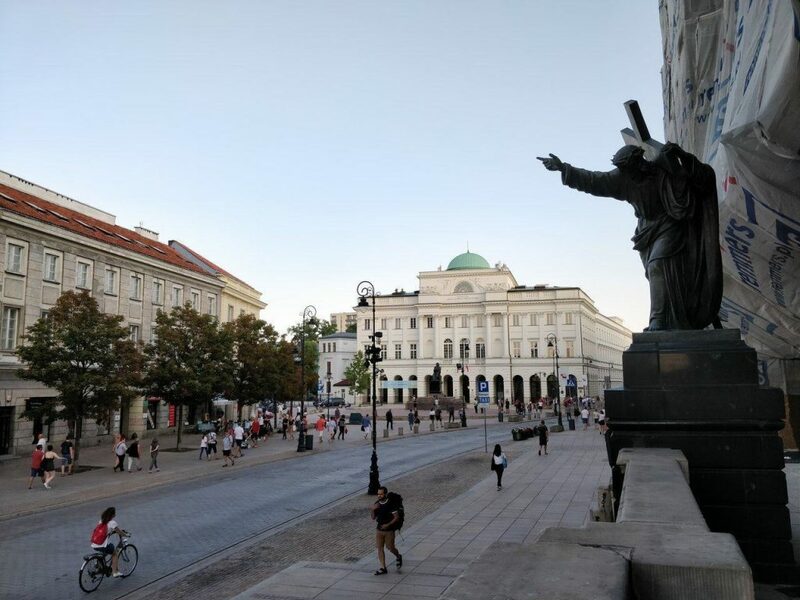 Add Zacheta, the National Gallery of Art to your list too and my favourite, the Ethnographic Museum for a glimpse of Polish culture, which is some of the popular things to do in Warsaw Poland. But if you are interested in something that is slightly off the beaten track and is probably a little quirky, then look no further than a big giant palm tree, right in the heart of a traffic island. You may have ignored it initially , especially when you see such grand monuments around you but if you look at it rather closely, you will wonder what a palm tree is doing, planted right in the middle of a street in an European country. I almost missed it, but my curiosity is kindled as Hana points to it. It is actually not a tree, she says but a sculpture. The steel column is actually with leaves made from polyethylene while it is covered with natural bark. Hana told me the story behind the palm tree that sent the politicians of Warsaw into a tizzy. An artist, Joanna Rajkowska was fascinated by the palm when she visited Israel that she convinced the powers to be to create one in Warsaw. It was created in California and came with love from Jerusalem and the local Warsawians fell absolutely in love with it. So there it stands right in the heart of the Royal Route. To me, it is one of my favourite things to see in Warsaw. The Royal Route also has a melodious touch to it where we go on a musical journey of Poland’s favourite composer, Frederic Chopin. A lilting melody haunts me and I follow it, only to discover that it is being played from stone benches in front of the monuments. 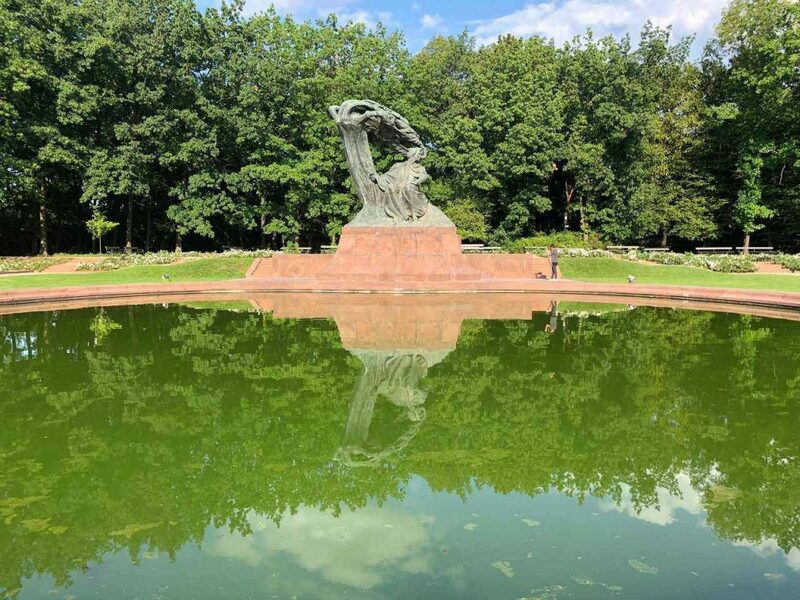 If you have just 48 hours in Warsaw, then the musical trail of Chopin should be in your Warsaw sightseeing itinerary. These benches along the Royal Route in the Old Town plays little notes of music from Chopin’s life. I am inside a quaint cafe called Chopin’s Point where the composer played the piano when he was barely 13. A visit to the museum tells you snippets of his life but his story literally tugs at your heart strings. Chopin who pined for his homeland, even after he left Poland for Paris and was never able to return. There is music from every bench—from across the house, Czapski Palace where he stayed to the Vistants’ Church where he played for the first time. These are some of the popular landmarks and things to see in Warsaw. Each excerpt of music narrates an episode from his life. At the end of the trail, I stand in front of the Holy Cross Church where a tiny urn inside a pillar has a part of Chopin locked inside it—his heart. It was Chopin’s last desire to be buried in his home country, but the political landscape did not allow it. He died unfulfilled in Paris, but his sister smuggled his heart and brought it down to the church and it lies in an urn, preserved in cognac. And so that is where it lies till date, singing an unheard elegy to the musician. Hana adds that the urn was hidden by the church during the war torn era and even today you can see the marks on the walls pierced by the bullets.The Nazis tried everything in their midst to destroy evidence of Chopin in Warsaw, including destroying his statue at the Lazienki Park and they even managed it, but the statue has a story behind it as well. Standing there and listening to his music, while watching the reflection of the trees in the waters, where the statue stood, I am lost in the stories. As the bars of music slowly die down, the poignant tale ends as Hana and I walk around this lush park. To me , walking in this park and exploring the monuments is one of the favourite things to do in Warsaw Poland. 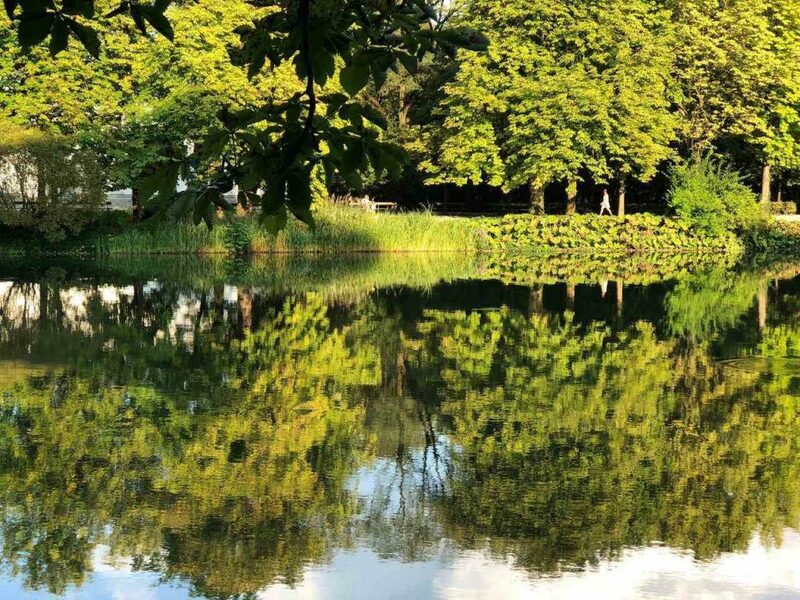 Lazienki means bath and the entire park is an ode to natural beauty . 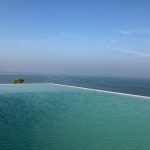 However it is the Water Palace or the Palace on the Island as it is called that takes my breath away. 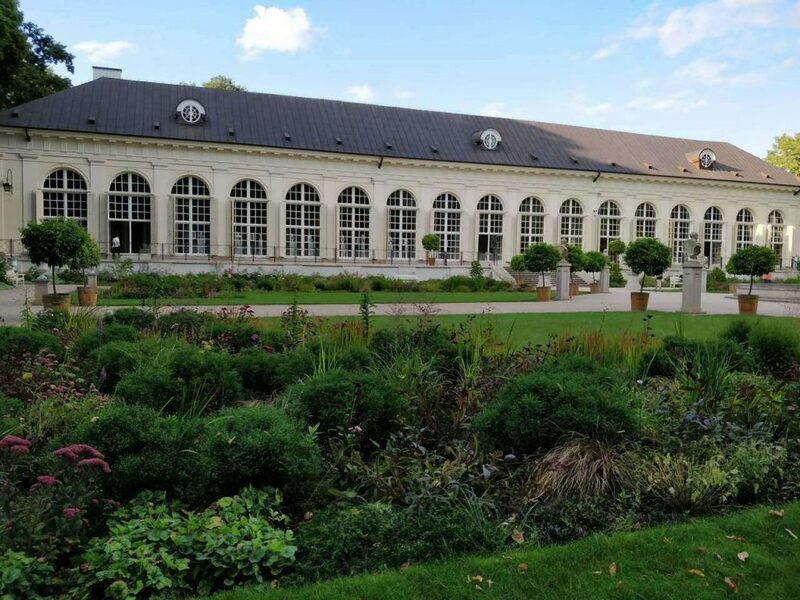 It was a private bathhouse for the royalty and it was owned by the last king of the Poland, Stainslaw August Poniatowski who made it into his private residence. 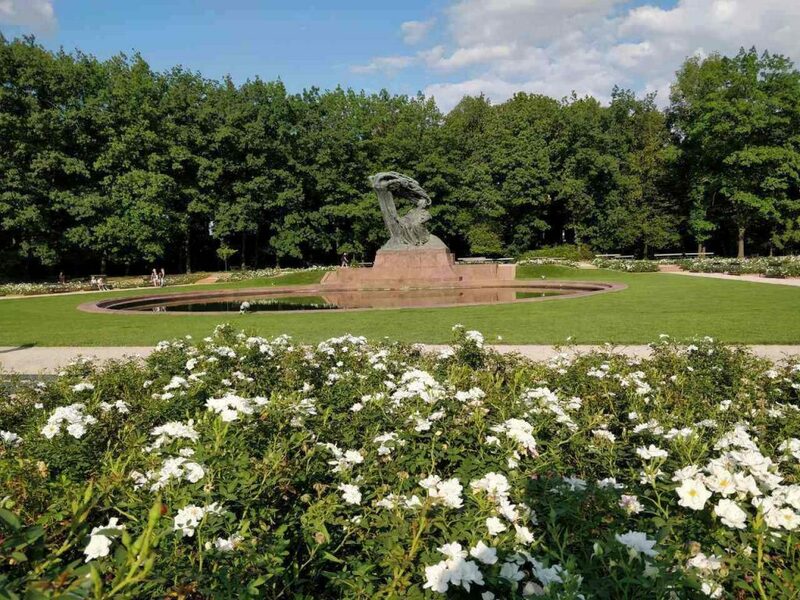 The park itself is on the Royal Route, which is one of the things to see in Warsaw and it is filled with more palaces, mansions, pavilions, gardens, sculptures and lakes , an orangery and even a classic amphitheatre as well. And an ideal way to live it up is to have a fun picnic on its lush lawns while watching peacocks dance and squirrels chase each other and listening to the songs of the birds. 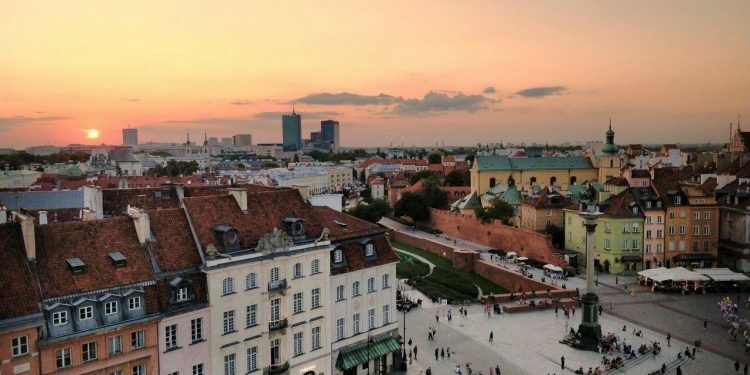 This is one of the best things to do in Warsaw if you have just 48 hours in Warsaw. I am on the last leg of the Royal Route and we are driving down towards the outskirts of Warsaw to a little district called Wilanow. Hana is of course full of stories. The kings of Poland lived and worked in the Royal Castle in the Old Town, but one of them decided that he wanted his home to be far away from his workplace. And so while the Royal Castle in the Old Town was considered his workspace , he chose Wilanow as his residential palace . 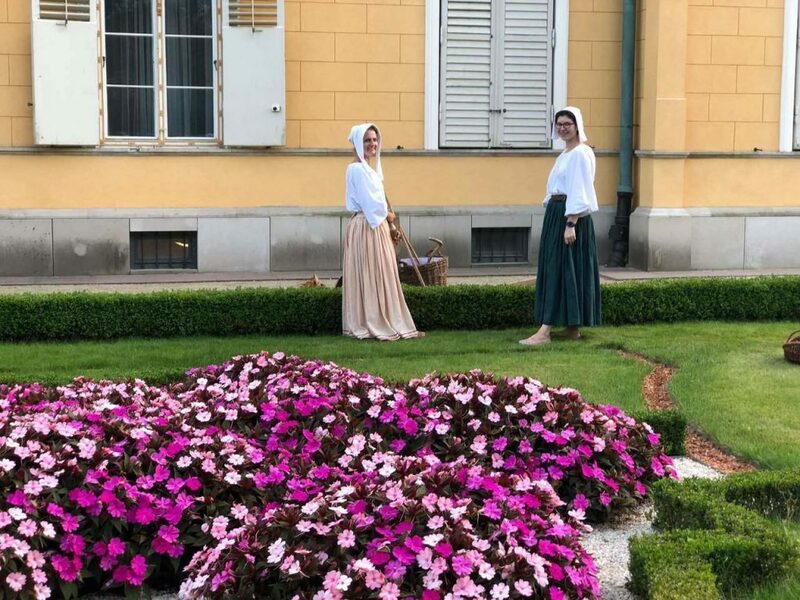 As my guide Hannah says , “It would have taken a messenger to reach Wilanow from Warsaw at least a day on horseback in case they needed to reach the king and he was happy with that “. 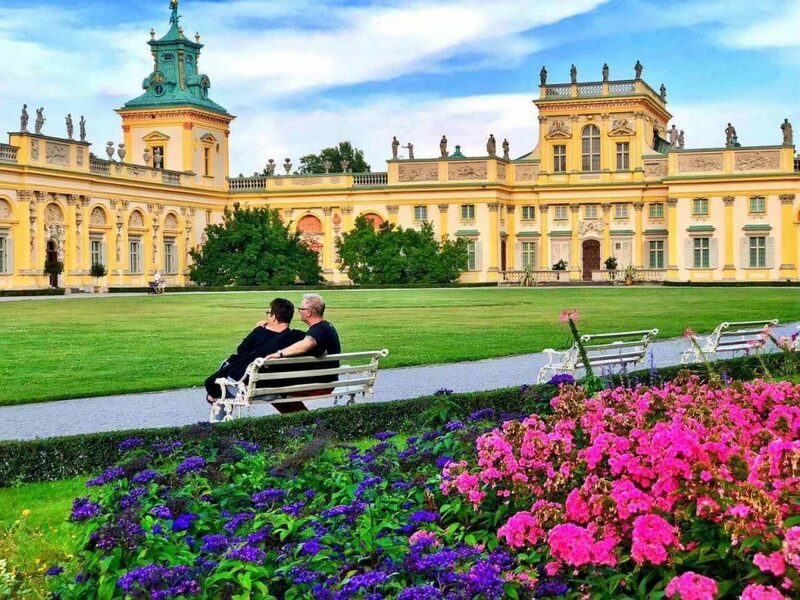 There is just one word to describe the Wilanow Palace – Awestruck. It is more than just a palace. The Baroque monument set in sprawling 45 acres of gardens takes you to an era of Poland that has been lost. To the people, it is all about nostalgia. It is a treasure that they regard as a symbol of the glory of their country which was destroyed by the wars. Built by King Jan 111 Soblieski in the 17th century, the interiors are grand . 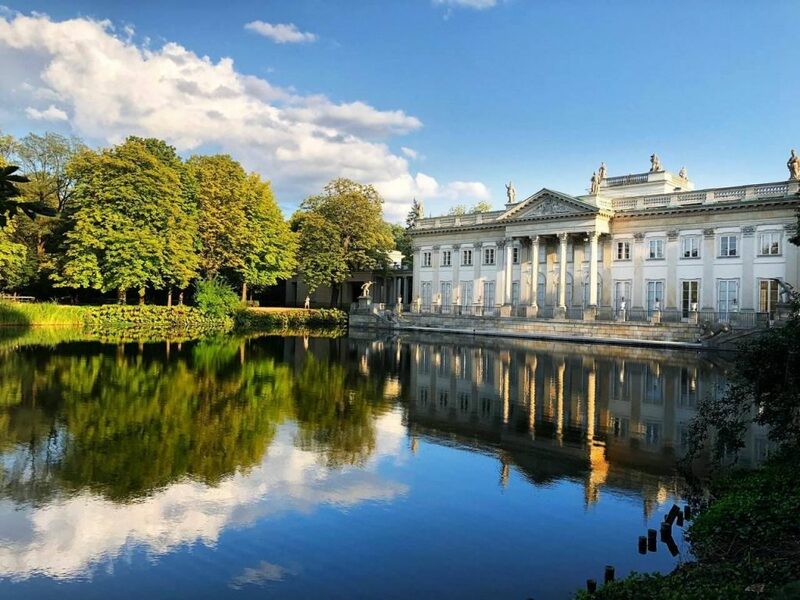 The king who was looking for a home far away from Warsaw called it “Villa Nova” and built a brick manor house, which eventually became a massive and magnificent Wilanow Palace. The palace is now a museum and the Polish Portrait Gallery is not to be missed. But it is the gardens that is absolutely breathtaking. The park is landscaped with a dual level Baroque gardens and there is also a Renaissance designed rose garden besides a classical English and a Chinese garden. Hana says that in the winters it is illuminated by lamps that you actually feel like you are in a wonderland. Wilanow Palace fortunately escaped the destruction of War although the treasures were looted and it eventually became a seat of the Communist government. Hana says that it is only in recent times that the palace has been restored to its original glory. Standing there I realize that fairy tale lands do exist here. No wonder it is called the Polish Versailles. The silence is very soothing almost taking you back to the time when Poland was an idyllic land. Warsaw has always been referred to as the Phoneix City but it is the people and their stories that touched me. Tears well up in my eyes as I listen to the courageous and yet tragic tales of the Warsaw Uprising in the Museum, one of the places to visit in Warsaw.The operation was a dare devilry activity fought by by the Polish Home Army to free Warsaw from German occupation. The Soviet troops however watched as the Germans systematically annihilated the brave Poles and razed the city to the ground and did not allow the Allies to help Poland. Every family has lost a member to the Uprising. Life in the ghetto was a torture read the posters there as they showed us a glimpse into the lives of these men and women and even little children who fought until death . As I leave the museum , Hana shows me the remains of the wall that was once the ghetto. Time sometimes does not heal wounds . But you cannot help but be overwhelmed by the cheerful spirit of the Polish. 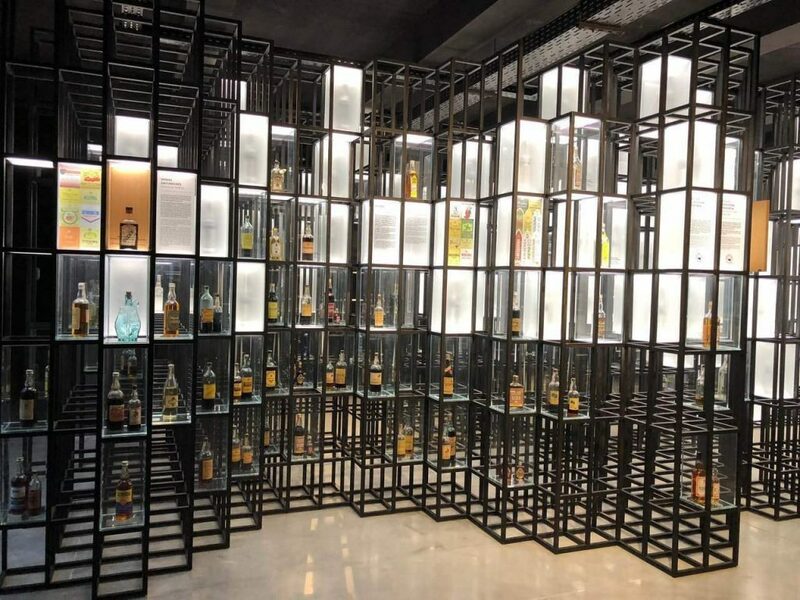 And speaking of spirits, it is only apt that I end my tryst with Warsaw in a vodka museum, housed in an ancient distillery. Despite the turbulent times, the spirit of Polish vodka has managed to tide against the flow . “Is vodka Russian or Polish ?” The answer is Polish . 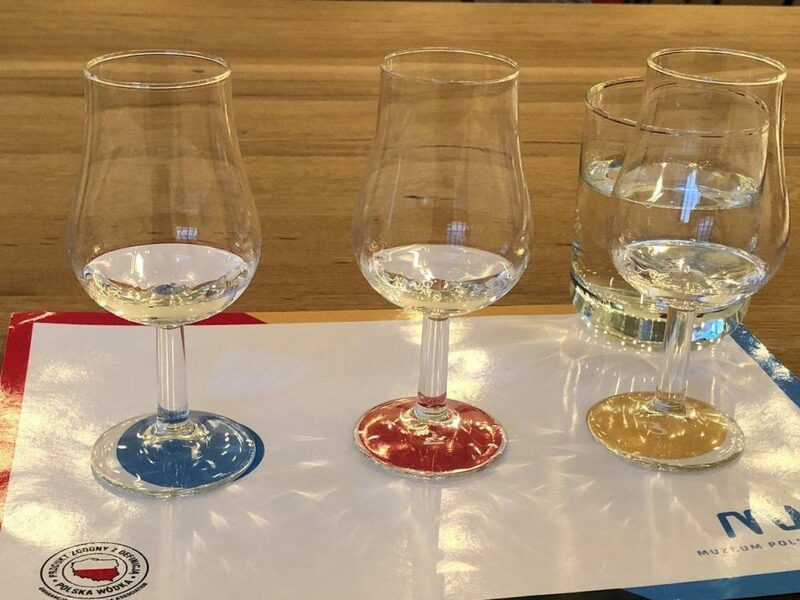 Since the medieval era , Polish vodka has been extremely popular in the country and during the Communist rule , the production did not stop although the state took over the control . Polish vodka can be made either with grains like rye or wheat or only with potatoes . We walk around the museum , one of the places to visit in Warsaw listening to snippets of history, but I even get an alchemist from the medieval era to give me a recipe of a potent cocktail of vodka with herbs and concoctions. Some of the Polish vodkas have celebrity status as well. Take Wyborowa, a popular brand which was apparently served on the first Concorde Flight but am more fascinated to sample the Wyborowa Exquisite which was served during the Oscars. Finally it is time for the tasting session. I am given three types of vodkas – with rye, wheat and potato. No prizes for guessing but my favourite is the creamier potato flavor and it is one of the best souvenirs from Poland. After a long day of walking around and listening to dark and gory tales, it is the perfect way to end the trip – in absolute high spirits. These are some of my experiences and recommended suggestions for things to do in Warsaw Poland. What would you suggest for a Warsaw sightseeing itinerary if you have just 48 hours in Warsaw ? 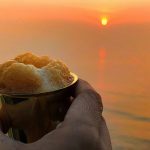 Photos courtesy Sharath Krishnamuthy. We were invited by Polish Tourism Board to spend a week in Poland and explore Krakow, Warsaw and Wroclaw.